The Deutsches Eck (German Corner) marks the spot where the Moselle (Mosel) flows into the Rhine. 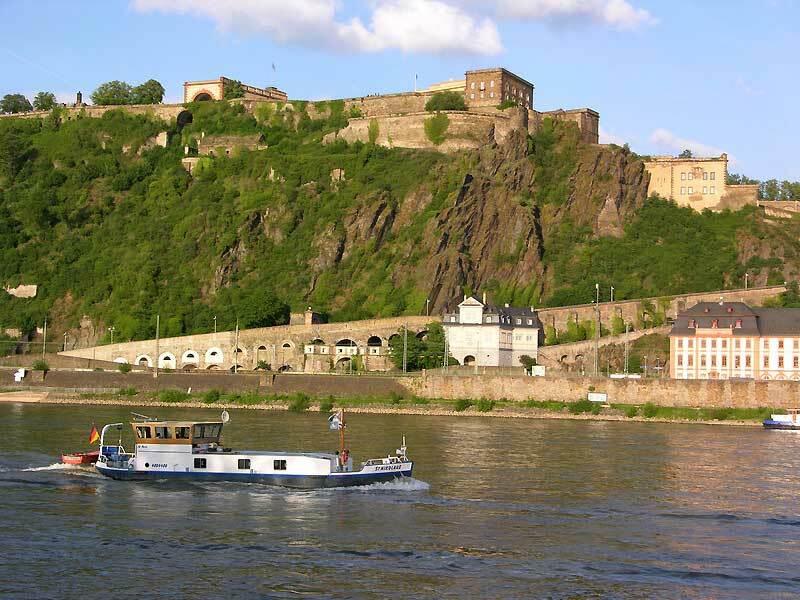 The Deutsches Eck is popular with people from Germany and river cruise passengers who visit Koblenz too. 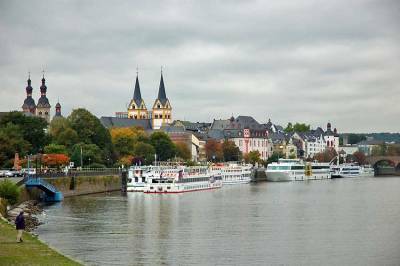 If you visit on a river cruise, you will only need to walk a few steps from your ship to the Deutsches Eck. See the monument here to Emperor William the Great, riding on horseback. Then stroll to St. Castor Basilica. St Castor’s was built in the 800s. The Treaty of Verdun was signed here, which led to the creation of Germany and France. The Ludwig Museum is next to St Castor’s. Also a few steps down the Rhine Promenade from the Deutsches Eck brings you to the gondola cable car over the Rhine River to the Ehrenbreitstein Fortress. 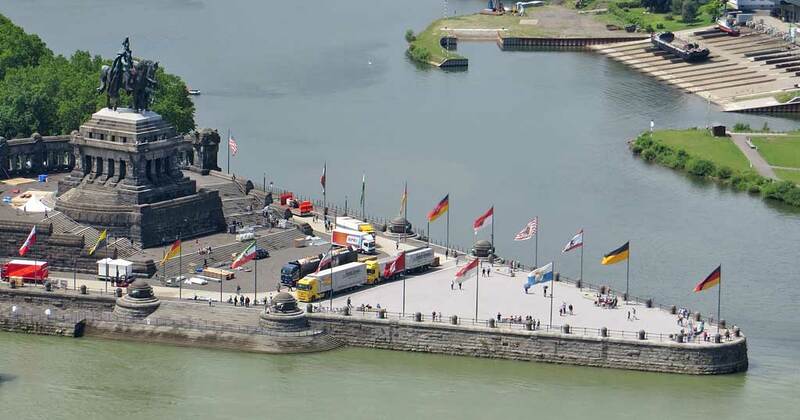 Ehrenbreitstein Fortress – one of the largest forts in Europe and a very popular tourist attraction in Koblenz. UNESCO has designated the Ehrenbreitstein Fortress as a World Heritage site. The fortress was built in the early 1800s. Ehrenbreitstein Fortress is 400 feet above the river and the Old Town, so the views are fabulous. The fortress is huge. You can wander through chambers and museum exhibits after you pay the small entrance fee. To get to Ehrenbreitstein Fortress, take the cable car from Old Town Koblenz beside the St Castor Basilica. The cable car ride over the Rhine River is as exciting as the fortress. 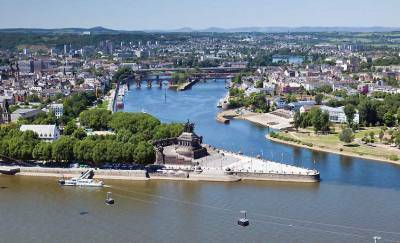 Start your Koblenz Old Town Walking Tour at the Deutsches Eck. Check out the Koblenz Old Town Walking Tour Map for directions. Head upstream along the Moselle River on the Peter-Altmeier-Ufer pedestrian walk for views of the Old Town and the Moselle River. 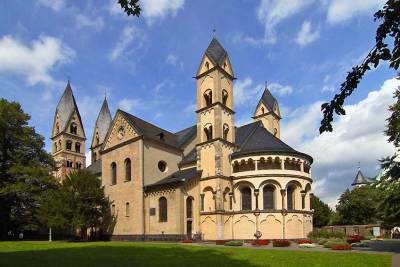 Then visit the Florinsmarkt Square, which includes St Florin’s Church (Florinkirche) and the Altes Kaufhaus. The Atles Kaufhaus is an old department store that is also known as the Buying and Dance House. To the north of Florinsmarkt and directly on the Moselle is the Alte Burg. The Alte Burg s a castle from the 1300s that is now the Municipal Archives of Koblenz. 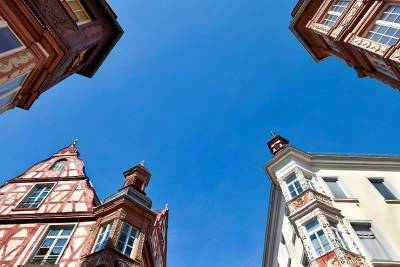 Next walk into the Old Town and stop to admire the The Four Towers (Vier Türme) – four Renaissance buildings from the late 1600s on the four corners of the intersection of the Am Plan and Marktstravsse. Immediately to the south is Am Plan Pedestrian Area. Overlooking the square is the Church of Our Lady, built in the 1200s. Check out the amazing stained glass. North of the church is the Munzplatz (Munz square). Just south of the Church of Our Lady is the Jesuit Square, which includes the Jesuit Church and City Hall. The Spitting Boy Fountain is off the western edge of this square. Be careful – the “boy” will spit water on you at random times. 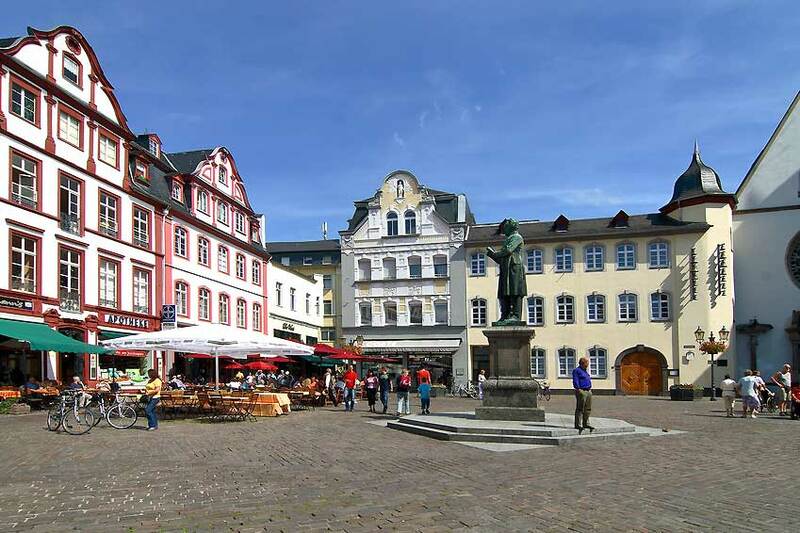 The next square to the south is the Görresplatz, which is named for the poet Josef Goerres. This is a great place to visit cafes at night. The Forum Confluentes cultural center is located at the western edge of the Old Town. 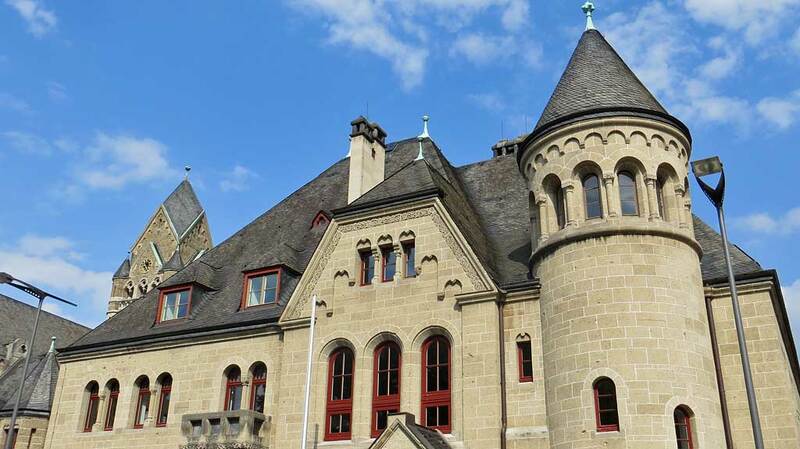 It includes the Forum Mittelrhein shopping mall, the City Library, the Romanticum interactive Rhine exhibit and the Mittelrhein (Middle Rhine) Museum. 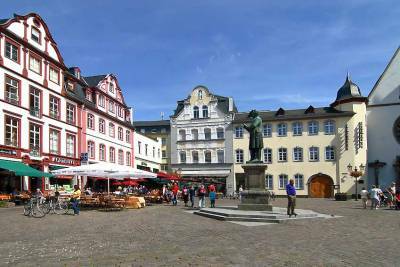 For an extended Koblenz Walking Tour, walk from the Mittelrhein Museum to the Weindorf Restaurant on the Rhine Promenade. The Weindorf Restaurant used to be a gigantic wine exhibition village, but is now a very popular place to eat. Then walk past the Electoral Palace and the Higher Regional Court. Behind the Higher Regional Court is the Memorial to victims of the Third Reich at Reichensperger Platz. Next continue on the Rhine Promenade toward the Deutsches Eck. Enjoy the gardens along the way. 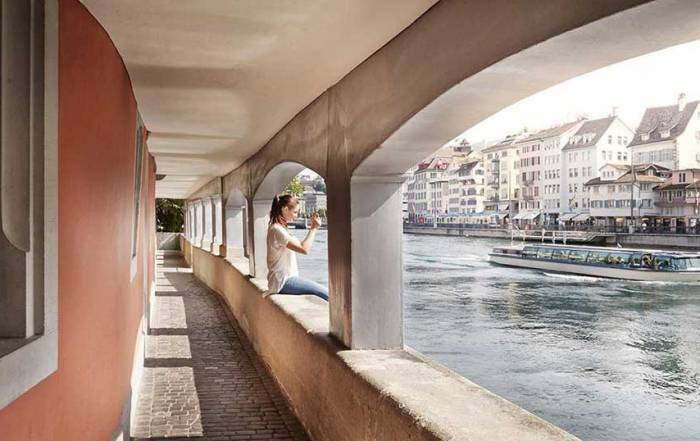 Consider having a meal at the historic Pegelhaus Rhine crane building on the river front. 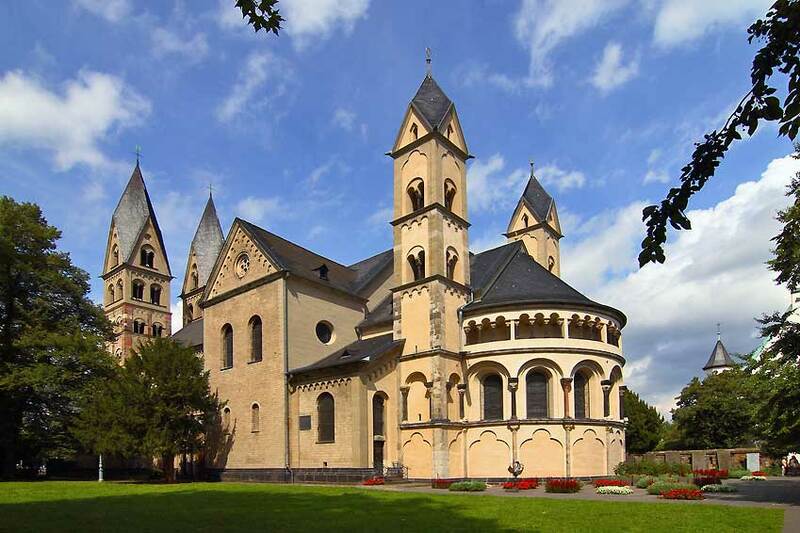 Your extended Koblenz Walk Tour ends when you reach the St Castor Basilica and the Deutsches Eck. Take a Moselle River Day Cruise on KD (Koln Dusseldorfer) from Koblenz to Cochem. The journey is 5 hours one way. 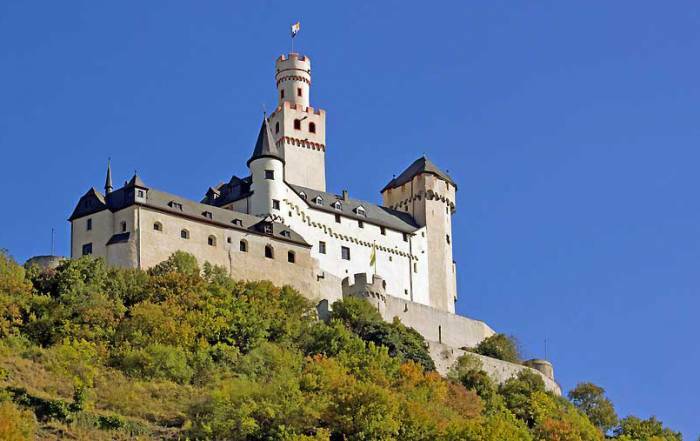 In Cochem visit the Cochem Imperial Castle (Reichsburg Cochem) or the more authentic castle called Burg Eltz. 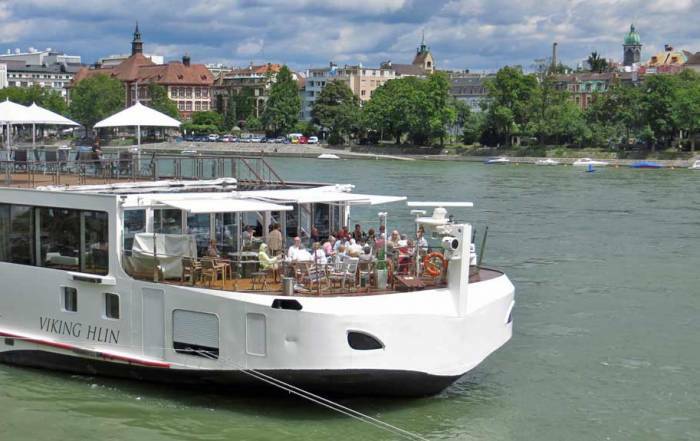 Take a Romantic Rhine Day Cruise to Rüdesheim. At Christmas, visit the Koblenzer Weihnachtsmarkt Christmas Market. Garten der Schmetterlinge Schloss Sayn – butterfly gardens and Schloss Sayn Castle, about 15 minutes from Koblenz. the Weindorf Restaurant on the Rhine Promenade. The Pegelhaus – originally a Rhine Crane (foot powered crane at the river edge) built in 1611, now a restaurant. For fine dining, try the Restaurant Historischer Weinkeller. Koblenz weather makes it s a summer tourist destination. Average temperatures peak in July and August at 80 F (26 C), while lows are about 55 F (13 C). By December and January average highs are 40 F (5 C) and average lows are just below freezing. Rainfall is light throughout the year, but tends to spike in July. Koblenz weather if usually perfect in August, making it the best time to visit Koblenz. 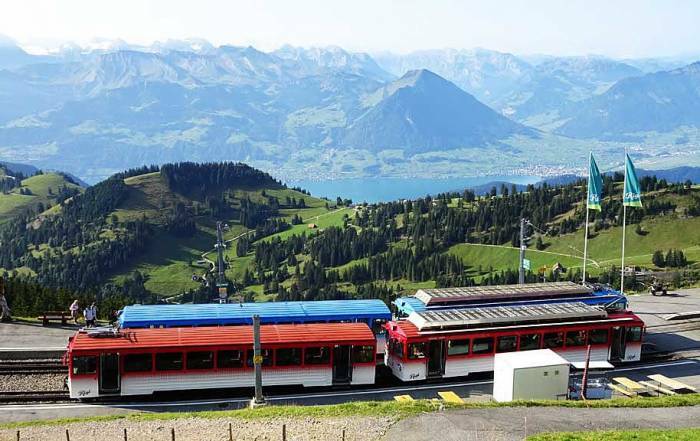 If you want to avoid the height of the tourist season, spring or fall may be more enjoyable though. 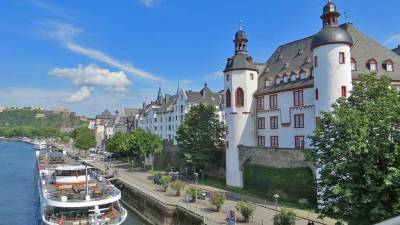 You can get to Koblenz easily on any major river cruise because it is a standard stop on the Rhine or Moselle Rivers. 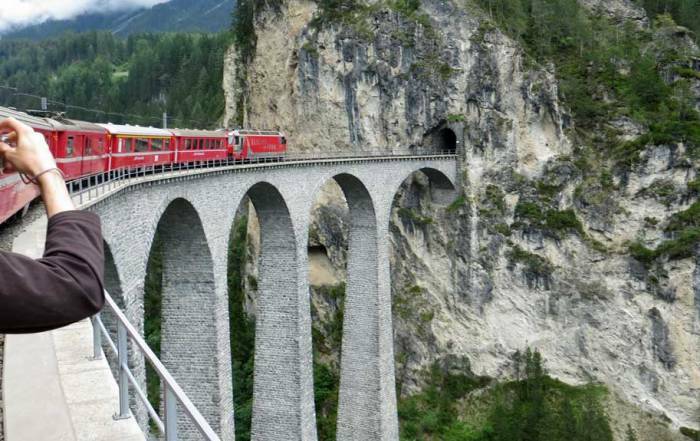 You can get to Koblenz by train easily too. Koblenz is about a 30 minute train ride from Cologne. Frankfurt is about 1.5 hours from Koblenz. The train station in Koblenz is about a 5 minute cab ride from the major sights in the Old Town or about a 15 minute walk. Alternately it’s a 15 minute walk south from the station to the Rhine and the beginning of the Rhine Promenade, which leads back to the Old Town. River cruise ships dock in the heart of the Old Town, so when you get to Koblenz, you can step off your boat and start a self guided walking tour. 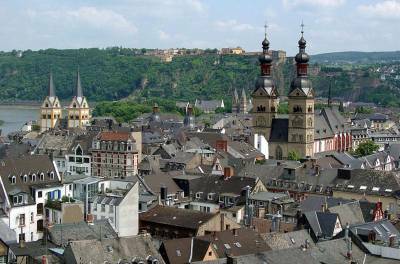 The city of Koblenz is on the Rhine between Cologne and Mainz. About 100,000 people live there. 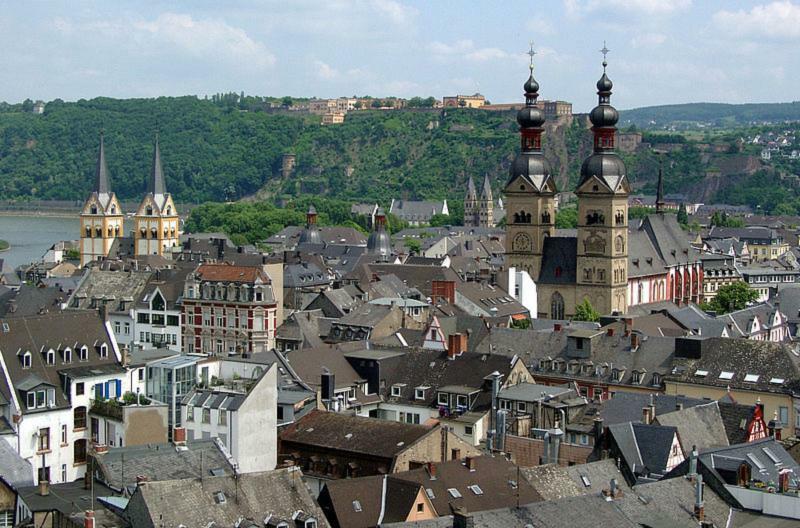 The name Koblenz comes from the word for confluence in Latin. That’s because Koblenz is where the Moselle River flows into the Rhine River. The confluence of the rivers is known as the Deutsches Eck. At the Deutsches Eck you will find a monument to Emperor William I and a great view of the two rivers meeting. 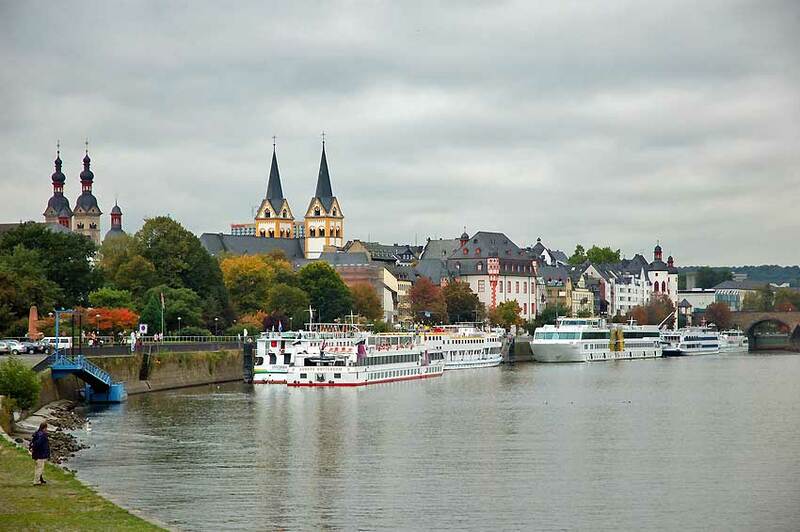 Koblenz is at the downstream end of the Romantic Rhine and some of the best river cruising in Europe.